A small apolitical jeep owners Whatsapp group that had started back in Aug/Sep 2013 with just a few of us had slowly and steadily grown in a much larger group, there was even a Facebook group by now. 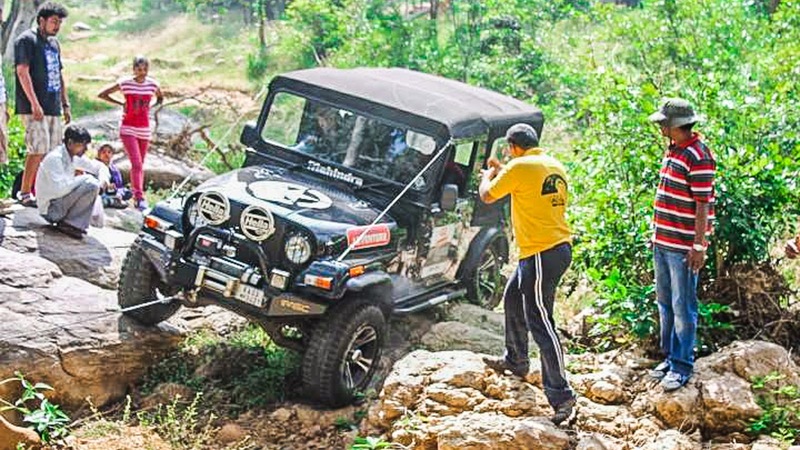 After a few rounds of discussion on the name for the group, we had settled down on calling it "Jeepers of Bangalore" a.k.a JoB. Using my limited photoshop skills, I got a logo design for the group and thus we were now bonded together with the JoB stickers on our jeeps. 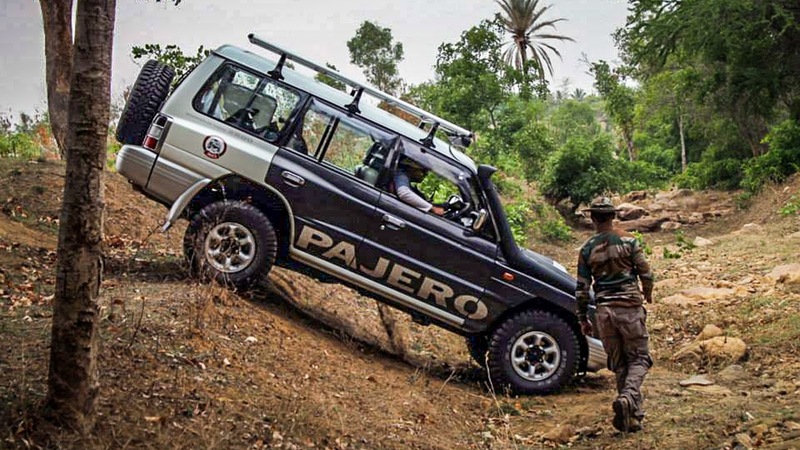 As JoB, we intend to enjoy some off-roading fun without bringing in any commercial interests and keep it as simple as we can. 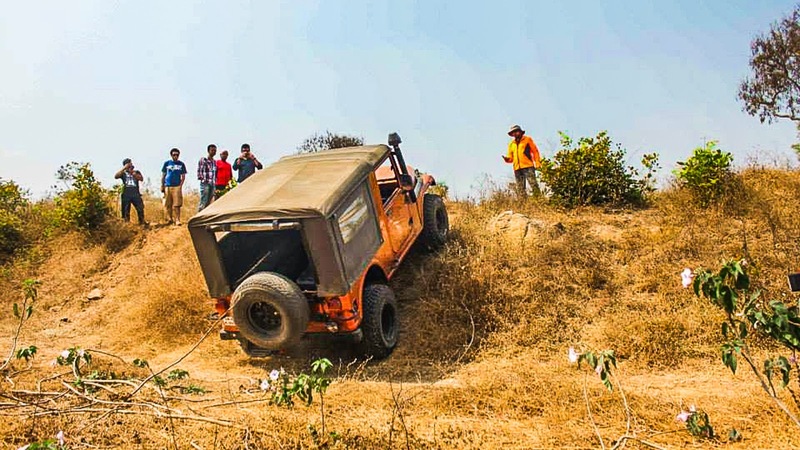 The group was aimed to create a platform for the newbies and veterans to interact and share views and knowledge about 4x4s and offroading. The members come from various backgrounds and the diversity helps in connecting with folks who are very resourceful in areas where you may not have any knowledge. 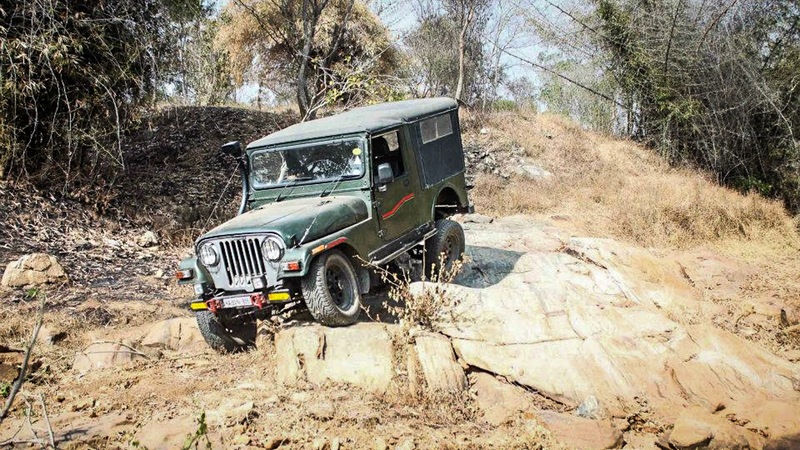 There isn’t any joining formality other than having a 4x4 and passion for offroading. 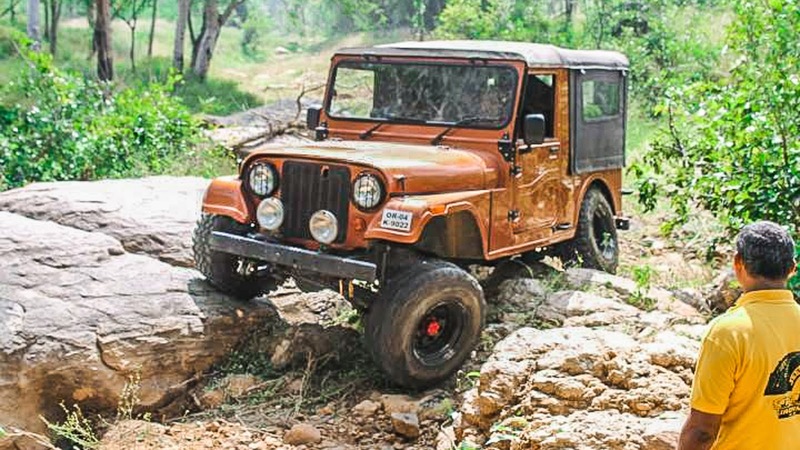 Everyday conversations in the group vary from technical discussions about engines, gearboxes and transmissions to which color looks the best or what new accessories someone has added on their jeep. About 400-500 messages a day is a norm and sometimes we hit that mark even in 3-4 hours if there was some interesting topic being discussed. A lot of members are now carrying portable battery packs and/or recharging their phones by twice a day, some even bought new phones with higher battery capacity just to be able to survive through the resource intensive conversations. 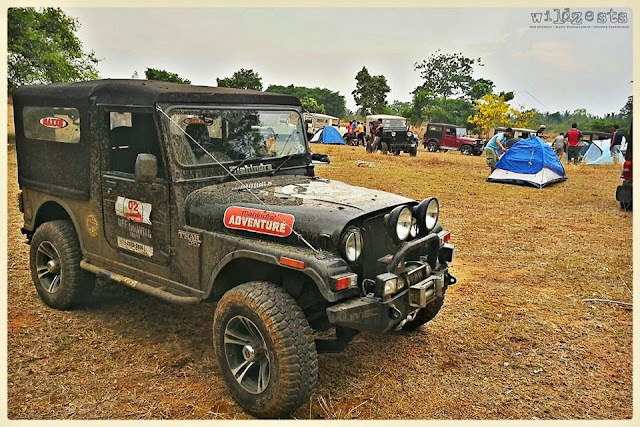 Now, we had done a camping trip sometime in January that was super fun event with the tiring offroad trail and evening barbeque with beverages. Everyone felt that it was time to do it again before the summer set in and the days became unbearably hot (yes, it happens even in Bangalore nowadays). A quick show of hands revealed that there was a lot many interested participants this time around. It was going to be a much bigger event than we’ve had before. 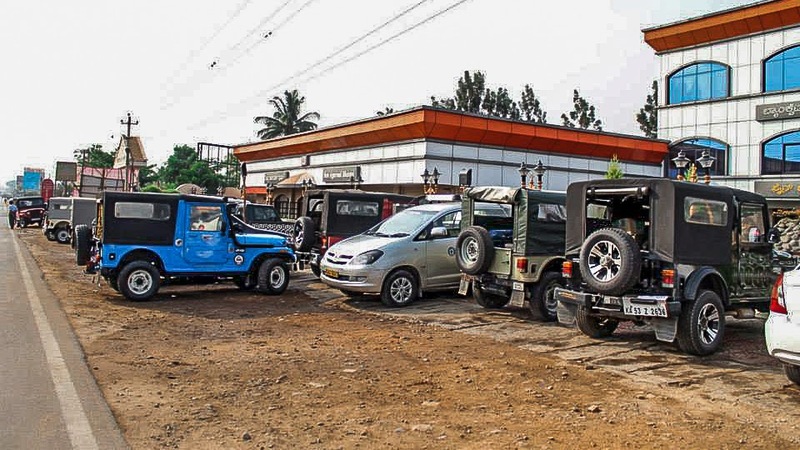 It made us happy and anxious about how it was all going to get managed considering that we hadn’t dealt with more than 10 jeep convoys so far. Plus, with about 20 odd jeeps turning up for the event there were going to be more than 40 people at the campsite for the night. We had to make sure everyone made through the trail safe and sound in time for the evening activities to setup their tents and fired up their barbeques. The Whatsapp interactions were further intensified, you could literally feel the excitement in the group. Some of us already had camping gear, but there were a few who were buying stuff especially for this event. 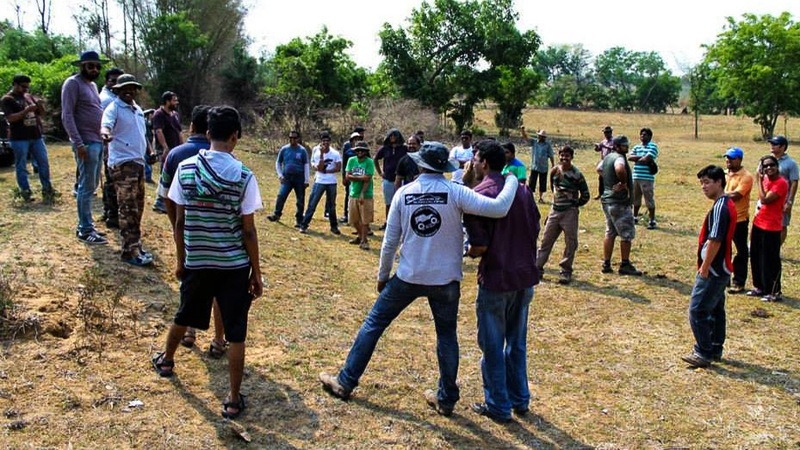 At the previous camping event, we were just about a dozen guys and we had volunteers who had brought food, beverages etc for the whole group, but this time it was going to be impossible to do that because of the size of the group. So a decision was made to have everyone do a potpourri of sorts and individually bring in stuff for the barbeque. We also needed more grills and luckily we had about 6 grills between all of us which was good. This actually proved to be a really good idea since we had a lot of choice once the grills were fired up. The day began with a 7AM customary breakfast meeting at the New Agarwal Bhavan on Tumkur road post which the convoy proceeded towards the trail with packed lunch of Idli-vadas. 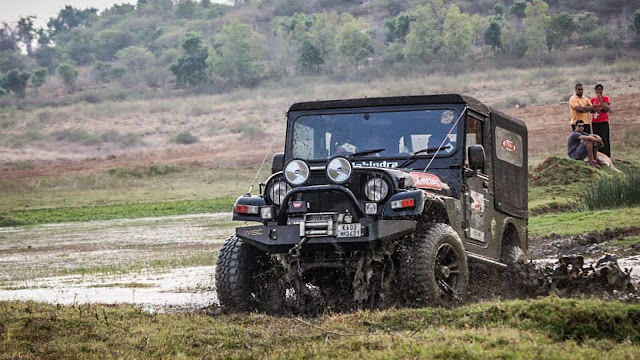 I had Yatin join me for the event, it was going to be his maiden off-road trip so he was rather excited to be there. A quick briefing session before we began helped in making sure everyone knew who the spotters were going to be and some other basic rules to be followed on the trail. Basically we wanted to make sure that people don’t go wandering off the trail on their own and/or take unnecessary risks and compromise safety in any way. There were quite a few newbies as well who were going to slot into 4L for the first time. As a group, we needed to give them enough support and encouragement to handle the stress on both man and machine. 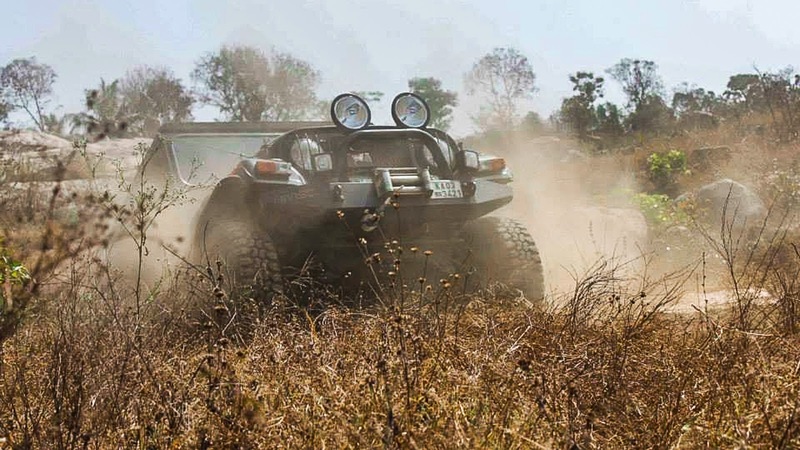 Our objective was very clear, the OTR was all about having fun, we weren’t out there to prove a point about anybody’s driving skill or capability of their machine. A successful day would be to complete the trail and return back safely without any major damage to any of the machines. 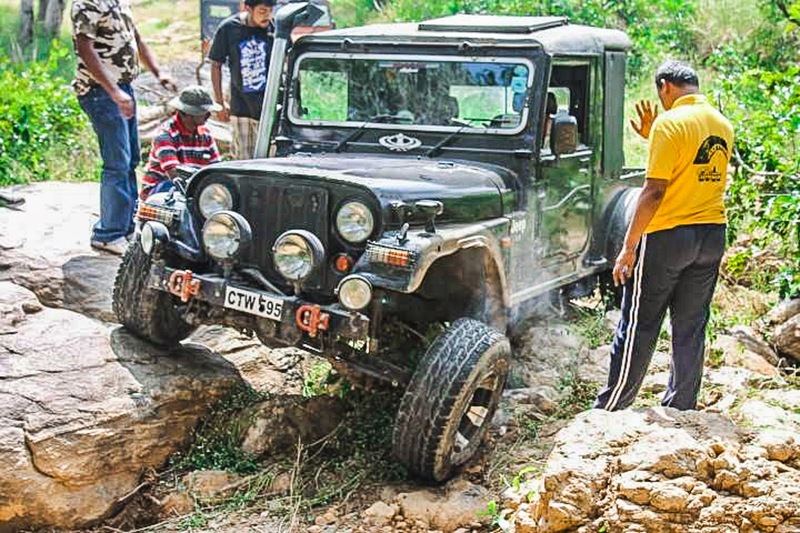 The trail is a rocky canal bed near a friend’s farm on the outskirts of Bangalore and has obstacles of varying degree of difficulty. 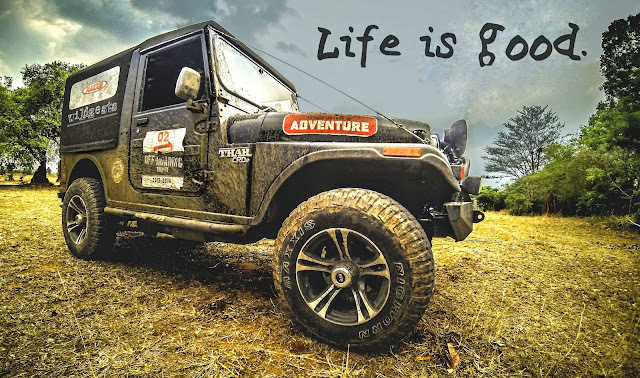 We had done a part of the same trail last time, but no matter how many times you've done an offroad trail, there's always some new surprise waiting for you each time you visit. There are various opportunities to make steep gradient climbs like this one. Or get tested for articulation on rocks like this. Get stuck and be winched out in some places. 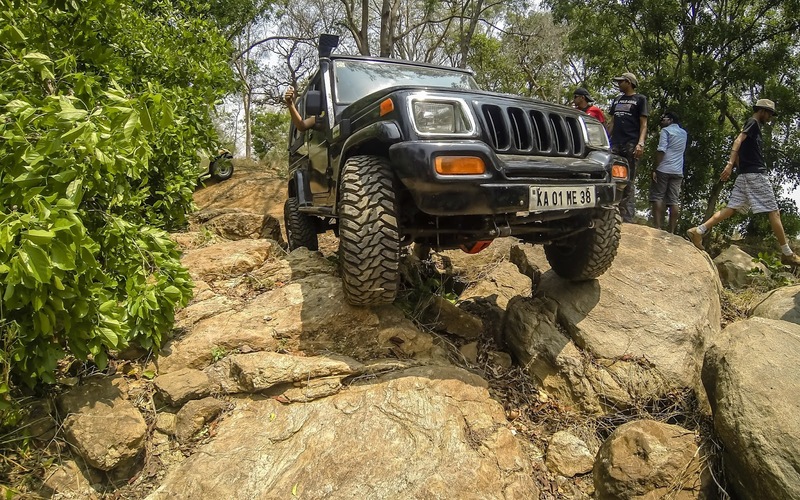 There are rock faces that make you skid all the way down till you hit the bumper on the ground. 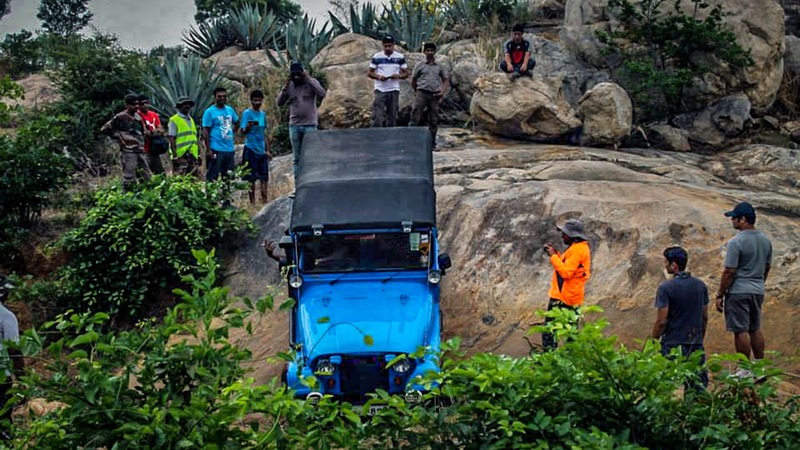 There’s also enough for the SUVs to try out even if they can’t risk the rocky obstacles. 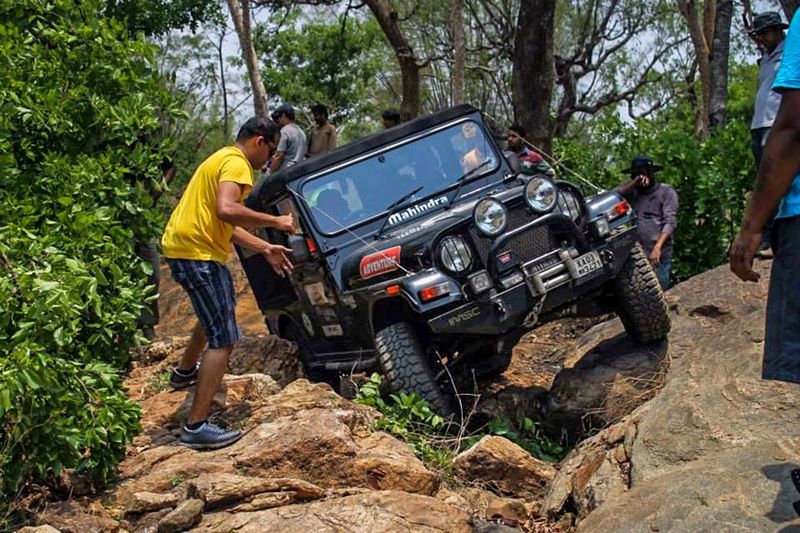 Most of the times, all you need is a good spotter to take you over those rocks without hitting anything underneath. End of the day, you know it’s all worth the effort when everyone makes it through the trail without any major breakdown. 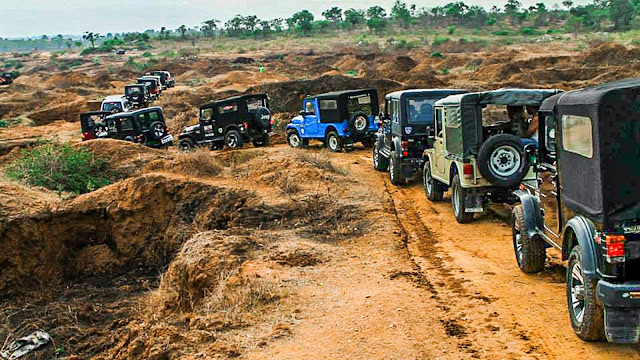 But this isn’t the end of the story - the actual party starts after the jeeps are parked. 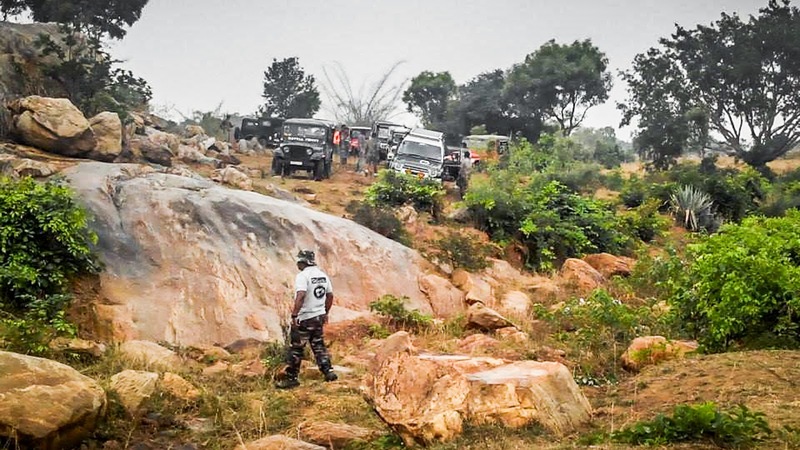 There’s a flurry of activities going around and people are busy pitching their tents, checking/fixing stuff on the jeep, setting up their barbeque grills and finally opening up their chiller boxes for refreshments. What follows is a lot of cooking, both food and stories until it’s time for people to crash into their tents (literally). PS> Most of the images used here are from other participants and sourced from the JoB FB group. Copyrights belong to the respective owners.